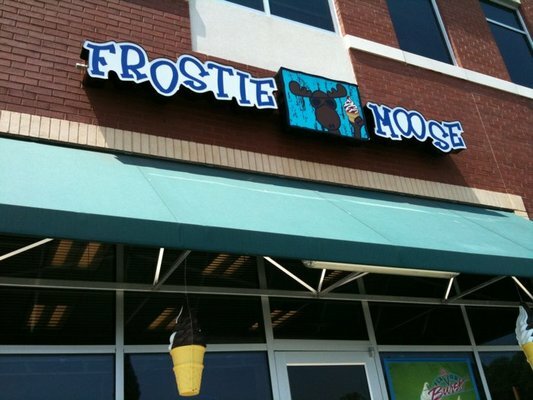 On Monday, we went to check out the Frostie Moose over at the intersection of Hoadly Road and the Prince William County Parkway. They were hosting a spirit night for our swim team, and who are we to not support the team, right? Of course right. So, my husband claims that he’s tried to take the kids before on two occasions and the store has been closed, even though their hours indicate they should be open. I can neither confirm nor deny that, but since he was asked for his input, there it is. Frostie Moose serves up ice cream soft-serve style and features several permanent flavors as well as a flavor of the day, which you can find up on the board or by following them on Facebook. They offer limited indoor and outdoor seating, and their prices seemed very comparable to other ice cream shops in the area. My kiddos went with a kiddie sized cone (which was pretty substantial in size) with sprinkles, and a chocolate milkshake and a cookie dough milk shake. Everyone was happy with their choices, and I thought the flavors were good (I snuck a bite from each kid- quality control check, you know how it is!) our only complaint was that the pieces of cookie dough in my son’s shake were too big to come up the straw, despite the fact that he snagged a bubble-tea sized one. His sister was happy to eat them with a spoon after he slurped up all the ice cream, though. 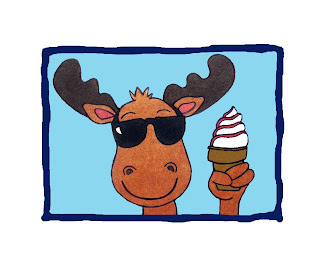 The kids enjoyed the giant moose mural, the owner and her staff seemed friendly and quick, and all three munchkins said they would be happy to come back anytime. I appreciate, too, that they offer booster night options. 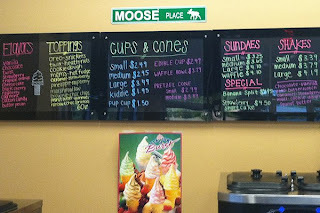 We enjoyed our visit, and think we’d definitely go back for another special treat night.